Handmade Exquisite Set! All A Grade & Material are used to make this beautiful set. This beautiful Necklace is handcrafted with new colours of Swarovski Crystals & it is like cool & calm sea are used to make this beautiful combination of moon & sea Necklace Set. 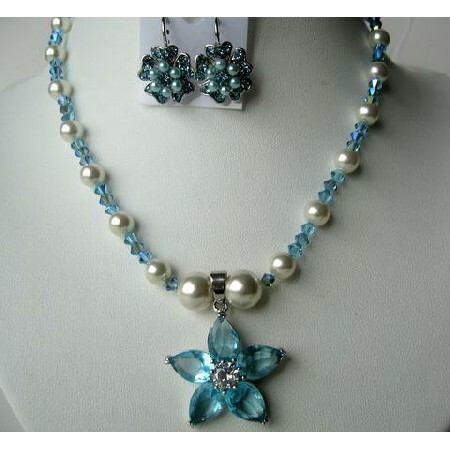 An aquamarine Crystals flowery Pendant is there between two 9mm white Pearls holding it perfectly.and to mach it a beautiful studd earring in Pearls & Crystals is there to complete the Set.